El Pais published a photograph it said was of ailing president Hugo Chavez in his hospital bed – provoking a furious reaction from Venezuela. SPAIN’S LEADING NEWSPAPER El Pais has apologised today after publishing a photograph supposedly of ailing Venezuelan President Hugo Chavez in his hospital bed, and then discovering the patient was actually someone else. The newspaper sparked a furious reaction from Venezuela by publishing the photograph of a man – purported to be Chavez in a Cuban hospital after his recent cancer operation – lying with tubes emerging from his mouth. “It is as grotesque as it is false,” Venezuelan Information Minister Ernesto Villegas said on his official Twitter account. The photograph was actually taken from a video of an operation posted on YouTube, he said. Venezuela’s embassy in Madrid in a statement branded the photo part of what it called a “campaign” by El Pais against leftist leader Chavez, who has received widely critical coverage from Spanish newspapers. Its decision to publish “a photograph of a patient with tubes inserted in him, making people think it is President Chavez and selling it as an ‘exclusive picture’, reveals the cruelty and lack of ethics in El Pais’s coverage of Venezuela,” the embassy said. El Pais, Spain’s best selling newspaper and one of the most influential in the Spanish-speaking world, said the photograph remained on its website for half an hour before being removed when the error was discovered. The centre-left newspaper also halted distribution of Thursday’s paper edition from newsstands, though some copies were sold. El Pais said in a statement it received the photo from the Gtres Online news agency, which claimed the image was of the Venezuelan leader. El Pais apologises to its readers for the harm caused. The newspaper has opened an investigation to determine the circumstances of what happened and the errors that may have been committed in verifying the photograph. The caption on the photograph had emphasised that El Pais was unable to independently verify the circumstances, the place and date of the photograph. Senior editors at El Pais declined to add anything to the statement, but a source at the paper said there was “consternation” in the newsroom. The Venezuelan information minister provided a link to a YouTube video, which he said was the source of the image. The video has an upload date of 6 August 2008, and is described as showing the intubation of a patient with acromegaly, an excess of growth hormone. The video includes the same image as appeared in El Pais. 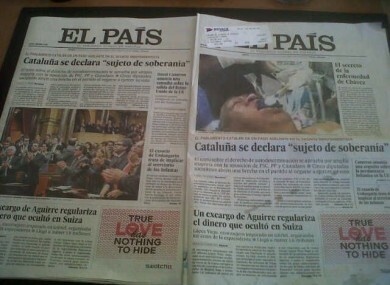 El Pais’s conservative rival El Mundo gloated over its competitor’s mistake. The paper’s director Pedro J. Ramirez boasted on Twitter that his paper had refused to buy the picture when it was offered for €30,000 euros, citing his editors’ reluctance to show the picture of the Venezuelan leader in such a state. Chavez, who has been convalescing in Cuba since his fourth round of cancer surgery, has not been seen in public since 10 December and official information about his health has been sketchy. The Venezuelan leader was too sick to attend his scheduled inauguration for a new term on January 10, but in recent days officials have said he has been making encouraging progress. Email “Spanish newspaper apologises for fake Chavez hospital picture”. Feedback on “Spanish newspaper apologises for fake Chavez hospital picture”.